Gordon Campbell was born on 6th January 1886, the son of retired Colonel Frederick Campbell and his wife Emilie. He was the couple’s ninth child, and the seventh of what would go on to be eight sons, all of whom attended the College. Gordon attended Dulwich Prep before arriving at the College in 1898. He left in 1900 in order to pursue a career in the Royal Navy. Once the War came around he was involved in the founding of the so-called “Q-Ships” project, which involved the disguising of fully-armed Naval vessels as merchant shipping in order to appear an easy target to German U-boats. 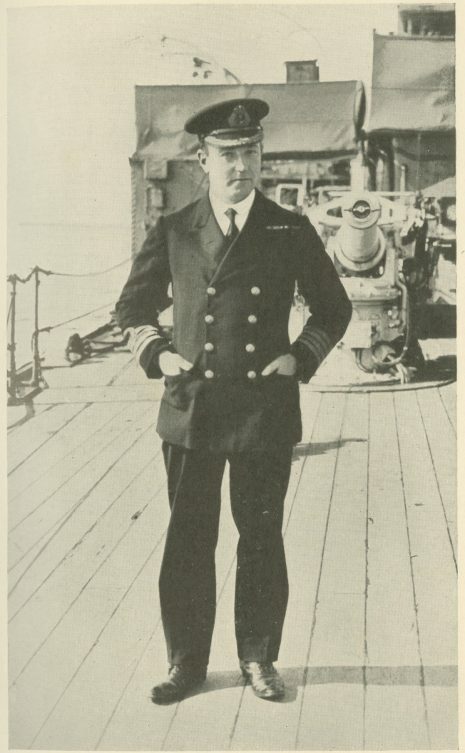 Photograph of Commander Gordon Campbell on deck, taken during 1917. Taken from the Dulwich College Archives. On February 17th 1917, Campbell was serving as Commander aboard one of the Q-Ships, HMS Farnborough, when it came under attack by a German U-boat. The Farnborough was hit and, in order to maintain the disguise, Campbell allowed her to begin to sink, drawing the U-boat in close, before retaliating & sinking the German submarine. Only after this did he radio for help, allowing the Farnborough to be safely beached the following evening. This action, described as “the supreme test of naval discipline”, resulted in Gordon Campbell being awarded the Victoria Cross, one of five O.A.s to be so honoured during the First World War. In addition to earning the V.C., Gordon also earned the Distinguished Service Order (D.S.O.) with two bars for his service during the War, as well as the French Croix de Guerre and Legion d’Honneur; additionally he was Captain of the H.M.S. Dunraven during an action in which two of his crew-members were also awarded the V.C. 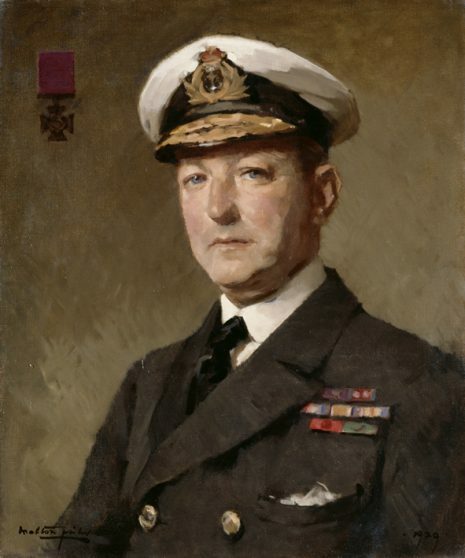 He stayed in the Navy after the War, ultimately reaching the rank of Vice-Admiral and serving as aide-de-camp to King George V for two years, before, in 1931, stepping down in order to serve as Member of Parliament for Burnley for four years. Upon the outbreak of the Second World War he enlisted in the Navy once again, serving a role mostly involved in the defence of the Cornish coast. Interestingly during the Second World War his nephew, Lorne Campbell (O.A. 1915-21) would also win the V.C. Gordon died in 1953 at the age of 67 in Isleworth, south west London; he was survived by his wife Mary and his two children. Portrait of Gordon Campbell, painted in 1922 by S. Melton Fisher, O.A. Currently displayed at Dulwich College.